Mexico. To most North Americans the word brings to mind one image: Beaches. Miles of them. With turquoise seas, powdery-white sand, and azure-blue skies. To others, it may bring to mind images of archaeological ruins. Mexico is studded with them. There is one treasure, however, which most tourists miss: the abundance of Marian shrines throughout the country. Mexico is like no other place in the world: It is home to not only the world-renowned Basilica of Our Lady of Guadalupe, it is home to a galaxy of additional NOTEWORTHY shrines as well. Although they are much-visited and beloved by the Mexican people, they are virtually unknown to the English-speaking world. It is these shrines which are the subject of this website. One pilgrim on a group tour put it this way: “Mexico—it’s like having dozens of Lourdes all in one country.” Lourdes is the famous Marian shrine in France. Several of the shrines—like Lourdes— have outstandi ng miracles associated with them and all have been approved by the Church. St. Pope John Paul ll visited a number of these shrines during his five trips to Mexico. Foremost among the Marian shrines in Mexico, of course, is the Basilica of Our Lady of Gaudalupe in Mexico City. Most travellers to the city are familiar with it. How could they not be? In that city her image is everywhere: on buses, on billboards, in parks, in restaurants, on store-fronts. You cannot miss her! An estimated 20 million pilgrims visit the Basilica every year: It is reputed to be the most-visited Marian shrine in the world. Ten years after the Spanish conquest of New Spain (present-day Mexico) Our Lady of Guadalupe appeared to a newly-baptized Chichimeca Indian named Juan Diego—he was canonized in 2002— and left her miraculous image on his cloak. The year was 1531. This apparition resulted in the conversion of millions to the Christian faith within a decade. Our Lady of Guadalupe came as a mother: “What do you need? Why are you afraid? Am I not here, your Mother?” Who can resist such a message? But what loving mother comes only once to visit her adult children? Our Lady was no exception. She didn’t stop at Guadalupe. She, this “Comfortress of the world” (according to Doctor of the Church, St. Alphonsus Liguori), continued her interventions in this new continent of America. She came to Patzcuaro, to Guadalajara, to Juquila. She came again and again in this new land. Oskar and Mary Hansen have been to Mexico many times and have visited these shrines. Mary Hansen, a former teacher, is now a freelance writer and has written articles for the NATIONAL CATHOLIC REGISTER, THE CATHOLIC REGISTER, ST. ANTHONY MESSENGER, CHICKEN SOUP FOR THE SOUL and others. She has an M.Div. degree in theology and an M.Ed. in Education. She writes from North Bay, Ontario, Canada. 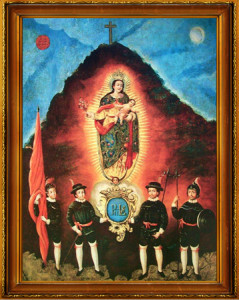 Permission for the painting on this page has been granted by the MUSEO VIRREINAL de GUADALUPE, Guadalupe, Zacatecas.